We have Midlands decals available! The larger 'Midlands' are roughly 10"x2.5" and are $8. The smaller, square birds are roughly 2.5" and are $6. These are available for purchase on Sundays (as long as supplies last) and you can pay with cash, check, or by Venmo. 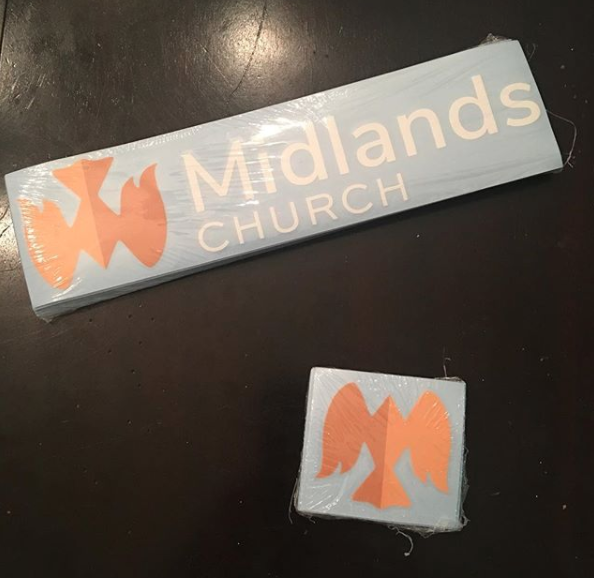 If you can't make it to church and would like to request decals to be held, email us at info@midlandschurch.org. Step 1: Clean the area with rubbing alcohol or soap and water. Don’t use Windex, or similar products, because it leaves a residue behind that prevents the sticker from sticking. Step 2: Prepare the sticker by firmly rubbing a squeegee or credit card across. This removes air bubbles and makes the sticker cling to the transfer tape. Step 3: Slowly peel the white paper backing off the sticker. If the sticker clings to the white backing paper, slowly replace the paper and repeat Step 2. Step 4: Slowly lower the sticker on the surface and rub it in place firmly with a squeegee or credit card. For best results, wait 24 hours before doing Step 5. Step 5: Slowly peel the clear transfer tape off at an angle. Be careful not to pull the sticker off the surface. If sticker begins pulling away from surface, repeat Step 4.